Where Have all the Swings gone? Commentators from the anglo saxon world and even our desi left intelligentsia who are waxing eloquent on the Charlie Hebdo massacre are making the most absurd amalgam between the French establishment and a truly radical far left wing magazine which shared absolutely nothing in common. Charlie Hebdo was born in rebellious times of May 1968 in France. It had been preceded by other radical magazines like Hara Kiri and Enragé and many others. But they are in many ways part of a lineage of a very long historical tradition dating back to the French revolution and Jacobins of radical caricature making and mocking the powers that be — religious or other — in every sphere of life. The French revolution was the time of incredibly powerful irreverence and it gave birth to a very incisive form of satire and lampooning. Many magazines with satirical drawing accompanying text emerged during this time and have continued since. Later a much softer version of this developed in Britain and elsewhere. Charile Hebdo has a bawdy, burlesque style of black humour. Not for the weak hearted. In 1970 Charlie Hebdo made fun of Charles de Gaulle, president and leader of the Resistance, on the day of his death, provoking demands from the Right for its ban. The publication ceased in 1981 and was revived in 1991. Charlie Hebdo and its cartoonists have faced hundreds of court cases since its creation. But it has continued to strike against powerful capitalists, bureaucratic and religious elites. The many targets of Charlie Hebdo’s cartoons and journalism have been the far right extremists, police repression, war mongering, the big corporate media, anti immigrant policies, capitalist and employer wrongdoing, the big banks and the stock markets, cuts in public spending and the military industrial complex, the nuclear industry, homophobia, conservative social values, denial of climate change, the food industry, the big pharma etc etc. 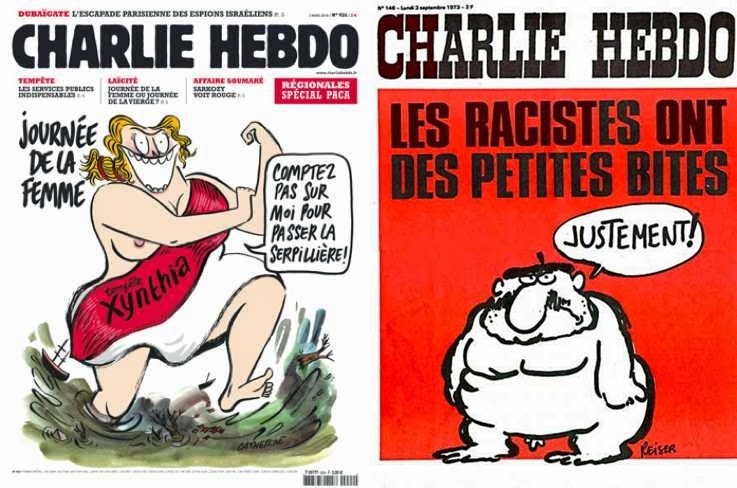 The politics of Charlie Hebdo has been progressive as it gets and informed by the new left around the world. They have been anti fascist, pro-abortion, pro-contraception in solidarity with the feminists, they stood up with the anti nuclear movement unlike their own friends on the left. The main anti-racist platform in France, SOS Racisme, teamed up with Charlie for campaigns against anti immigrant policies. They denounced the Right Wing opposition to legalise gay live-in relations. During the 1990’s war in Algeria when there were violent attacks from the fundamentalists on the local media and the artists, writers and cartoonists, many were forced into exile. 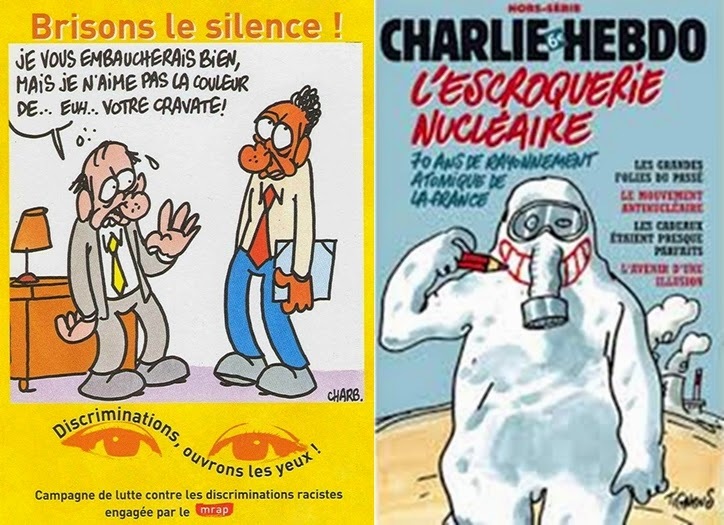 Charlie Hebdo opened its doors to numerous Algerian journalists and cartoonists in exile. All this goes back in fact because people like Bob Siné (the anarchist celebrity cartoonist from the 1950s and 1960s, Siné one of the oldest cartoonists who worked for Charlie Hebdo magazine till 2008.) faced umpteen law suits for supporting Algeria’s independence movement in the 1950’s. The massacre at Charlie Hebdo, has been condemned in France by the trade unions, by the anti nuclear movement, by women’s groups, by organisations of homeless, by the immigrants organisations all have offered help and solidarity. Thousands of people attended the solidarity demonstrations in Paris and other cities across France to express their outrage. Tens of thousands of Franco-Algerian, Franco-Moroccan and Franco-Tunisians were present in the demonstrations, carrying flags from the countries of the Maghreb. Journalists in Algeria and the Tunisian Trade Union of workers in Graphic Arts (Syndicat des métiers des arts plastiques tunisien) have issued statements in support of Charlie Hebdo, saying they have faced and still face similar threats and attacks from fundamentalists. 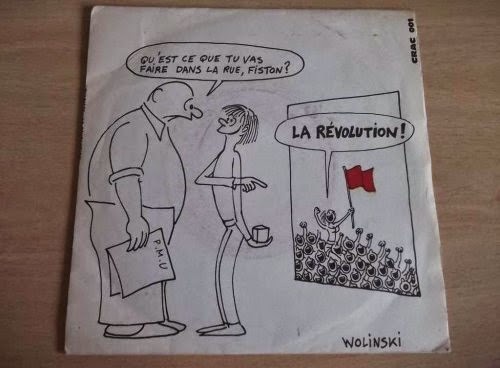 Georges Wolinski, who was very famous in France, was one of the longest standing members of Charlie Hebdo, was very close to the communist Party of France and the president of the France-Cuba friendship association. Close to 80 books of cartoon were penned by him, they are prized possessions of millions in France, Spain and elsewhere. Tignous, had his cartoons appear every week in Charlie but also on the pages of the daily l’Humanité (news paper of the Communist Party) and in the CGT trade union paper La Vie Ouvrière, in Telerama and L’Echo des Savanes. Tignous was a member of Cartoonists for Peace. Bella Ciao the famous Italian song of the left was sung at the funeral for Tignous. Stéphane Charbonier (known as Charb) the murdered editor of Charlie, was a member of the French Communist Party and a supporter of the Front de Gauche (the Left Front — a joint for of left groups), had opposed the 2005 proposed neoliberal European constitution. The 2009 book ‘Marx: Mode d’emploi’ (Marx: A User’s Guide) by the late far left intellectual Daniel Bensaid was attractively illustrated with funny drawings by Charb. Charb was also well known for his four volume ‘chien et chat anticapitalistes’ (anti capitalist Cats and Dogs cartoon books). At his funeral they played the Internatonale to bid farewell to him. Bernard Maris (or Uncle Bernard to Charlie Hebdo readers) a 1968 radical was one of main shareholders of Charlie Hebdo, was part of the editorial group. He was a reputed left economist, on the advisory board of ATTAC, the social movement body opposed to corporate globalization. His work appeared in a wide range of magazine and was popular on French Radio. He appeared in a 2010 Jean Luc Godard film 'Film Socialisme'. Philippe Honoré had joined Charlie Hebdo in 1992. His worked appeared in numerous magazines and papers including the the Trade Unions Magazine, La Vie Ouvier apart from Charlie Hebdo. He was self taught cartoonist, who was widely known for his book covers. He had a a very funny book on Nicolas Sarkozy’s Presdency called 'Je Hais les petites phrases'. His subtle humour stood out from his colleagues at Charlie Hebdo. They played the French song La Bute Rouge and the Bob Dylan Song Farewell Angelina sung by Joan Baez at his funeral at the Pére La Chaise cemetary. Charlie Hebdo magazine has been a well known and fervent opponent of Zionism and Israel’s regular assaults on Gaza. It defended Roma/gypsy people against police crackdowns and deportation. Charlie Hebdo has been part of the cultural intellectual infrastructure (where with all) of the left in France. Killing them has been like a body blow to the left sensibilities and to the cultural sphere in France. The Islamist echo effect on Charlie Hebdo murders in Paris is still on; there are now big violent street demo’s in North Africa (A report in El Watan of 17th January 2015 says ‘the slogan heard in the demonstration in Algeria after the Charlie Hebdo massacre was “Ahlyha nahya, ahlyha namout, wa alayha nalqa Allah” (pour - l’Etat islamique - nous vivons, pour lui nous allons mourir et rencontrer Dieu) [English Translation: For an Islamic State - we are living, for which we will die and encounter God]’) and the Middle East, also near home in Pakistan. I am now, with sadness, waiting for the ones that may happen in Delhi, in Bombay, in Calcutta and for the real prospect of our lefties joining them in solidarity with the hurt religious sentiment walas. Excellent article. I'm baffled by the modern 'left''s cowardice to confront certain forms of totalitarianism.